“Hillary Clinton wants to abolish the Second Amendment” has been Donald Trump’s oft-repeated besmirching of Clinton, and while that’s the usual level of Trump BS with nothing to support it, it’s impossible to deny that another Clinton presidency would be bad for the gun industry. When the assault weapons ban her husband signed into in 1994 law expired ten years later, Clinton fought to keep the law in place, a battle which was ultimately lost and ended up flooding the gun industry’s coffers to King Midas levels. One leading AR-15 manufacturer, Bushmaster, said in a 2012 report that the industry’s ability to sell these guns to civilians had, “increased long-term growth in the long-gun market while attracting a younger generation of shooters.” It most certainly has, and Adam Lanza and James Holmes are among those attracted by the military grade lethality of the AR-15. Of all the issues facing Americans in this historically acrimonious election year, gun control is among the most hotly contested. Although most surveys show the nation overall desires stricter gun laws, just how to go about that remains hotly contested, and with the NRA more powerful than ever and pouring rivers of money into the discussion, things will probably get more rancorous before they get better. In reality, the phrases like “military-style” that Trump used in his statement are among the main selling points for assault weapons like the hugely popular AR-15. The fact that the weapon is based on military design is its main selling point, and one that is reiterated ad nauseum by gun dealers. So what is Trump talking about? Why in the world would he put such an inaccurate statement on his website? The answer seems to lie with those overlords of the Republican party, the NRA, who endorsed Trump in May. Since getting into bed with gun manufacturers and using their mountainous profits to dive headfirst into politics, the NRA has become one of the most powerful lobbying groups in the United States. In the 2012 election alone the NRA spent at least $24 million backing various candidates—and that’s just in public donations. Trump isn’t exactly hurting for money as his campaign raised $51 million in June alone, but every presidential campaign could use more cash on hand—and the NRA offers something far more important to the politicians it purchases: votes. The road to D.C. is paved with the broken political dreams of politicians not willing to play ball with NRA CEO (and possible friend of the devil) Wayne LaPierre and his flunkies, as the NRA brings with it millions of single-issue voters who will blindly follow whoever the NRA tells them to. And wouldn’t you know it: mere days after The Donald said that people on the terror watch and no-fly lists should be banned from buying guns he changed his tune after a private meeting with Mr. LaPierre (and possibly the devil). For her part Clinton has a very consistent gun control record, and one that has earned her straight F’s on her NRA report cards over the years, a distinction the presumed Democratic candidate wears as a badge of honor. Hillary’s proposed gun control platform centers around her ability to close the myriad loopholes that the NRA and gun manufacturers have been poking in legislation for years. 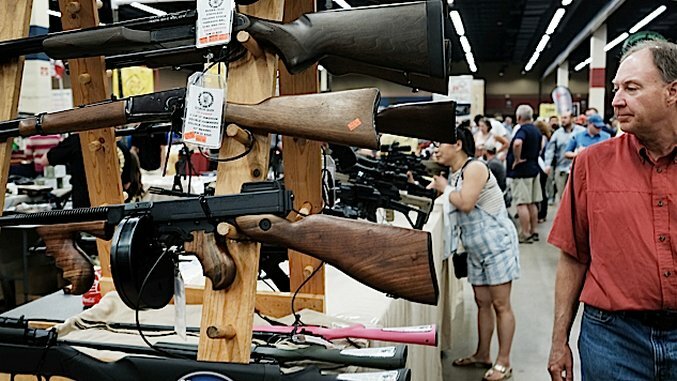 Chief among those would be the gun show and internet loopholes, as well as the so-called “Charleston loophole.” Preposterously, those who traffic in guns on the internet or at gun shows don’t have to abide by the same rules and regulations as brick and mortar gun shops—something so archaic in 2016 it’d be laughable if people weren’t dying because of it. For a Democratic politician who has made some head-scratchingly anti-Democratic statements and votes over the years—voting against equal marriage rights, voting for the Iraq war, voting for the Patriot Act (twice) among them—Clinton has remained steadfast on the gun issue. Clinton has even taken it a step further, promising executive action if Congress refuses to act on gun control, including the repeal of the “Protection of Lawful Commerce in Arms Act”, which prevents gun manufacturers and dealers from being held liable for any damaged caused by irresponsible business practices. In an overly litigious American society, it’s very telling that the gun industry has somehow become above legal reproach. Looking closer at Trump’s proposed policies one finds a lot of the same hyperbole politicians are fond of saying about how we should arrest gangbangers and drug dealers. What stands out however, is Trump’s glowing endorsement of Richmond, Virginia’s Project Exile, federal program that sends anyone caught with an illegal firearm to federal prison for a mandatory minimum sentence of five years. While the program was hailed as a success by many and was eventually adopted by the entire commonwealth, a vastly diverse mix of groups protested the law. Gun rights advocates, black rights groups and libertarians were among the groups against the law, and considering what a massive problem the prison industrial complex in America is, most of the public is loathe to continue feeding that machine. Implementing a similar plan nationwide is rife with all kinds of troubling questions—especially considering it’s coming from The Orange One—but at least it’s something more substantial than “we should arrest the bad guys”, and perhaps it could help break the NRA’s stranglehold on the GOP. In an election year with historically low image ratings for both candidates, the positions each takes on issues like guns—and how they handle their presentation of these positions—could decide the election. It will be interested to see how both Trump and the NRA—which was once described by former company president Warren Cassidy as “One of the world’s great religions”—continue to deflect the public’s attention from things like mass shootings via fear mongering and fanning the flames of ignorance and fear. Flames which are already mightily ablaze via Donald Trump’s ascension to the Republican presidential nominee.